The death toll from a building collapse in Istanbul has climbed to 16 after several more bodies were recovered, Interior Minister Süleyman Soylu said Friday. "Since our last statement, two more children have died," he said, including a 1-year-old girl. Soylu stated that search efforts were stopped in the middle of the night because there was a risk the neighbouring apartment could collapse. "Search has now resumed. We will have more balanced [rescue] work," he said, adding that teams will continue monitoring the adjacent building with tracking devices. A 16-year-old boy was also rescued from the rubble in the early hours of Friday, 45 hours after the collapse, Soylu said, adding that his rescue raised the number of people who have been pulled out alive to 14. Four of the 14 people rescued are listed in critical condition, Anadolu reported. "We hope to bring out those inside safely," Soylu told reporters. He promised punishment for anyone found responsible for the collapse. An intense rescue operation continued through the night and into a rainy and gray Thursday. Search crews were asking bystanders to remain silent so that any screams for help from survivors could be heard. On Thursday morning, 5-year-old Havva Tekgöz was rescued from the debris after 18 hours. Broadcast images showed her blinking as she was carried out on a stretcher, wearing a neck brace, to a waiting ambulance. Governor Yerlikaya said Thursday evening that Tekgöz had undergone a successful surgery. He also said the girl was reunited with her mother, who was rescued on Wednesday. Tekgöz was the second child to be rescued. A 9-year-old boy was saved on Wednesday. 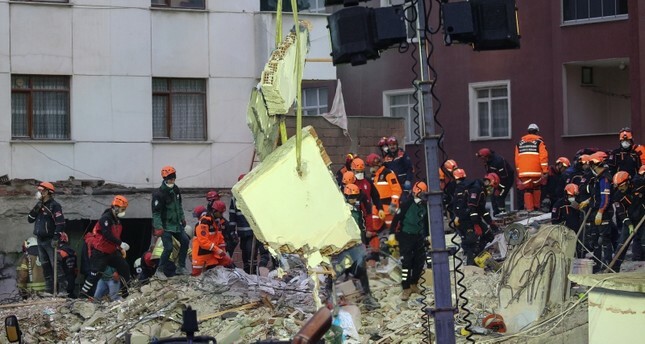 The Istanbul prosecutor's office has started an investigation into the cause of the collapse. It wasn't immediately clear what caused it. Yerlikaya said Wednesday that 43 people were registered in 14 apartments at the address, but added that the top three floors of the building had been built illegally.